Is it weird for me to say that I could NEVER picture a recipe like this on my blog? The reason I ask that is because it’s the truth, and the reason for that truth is that I NEVER EVER would have thought this healthifying a pretzel was possible. But my friends, let’s just take a moment. That’s exactly what my sister and I did. Well, mostly me for one major reason. But before I give you the lowdown on the story behind these little drug bites, I wanna ask you a question: how obsessed were you with Wetzel’s Pretzel as a kid? Come on, don’t be shy. I volunteer to be the first to say that I was ADDICTED to the food of Wetzel’s Pretzel, especially the Almond Crunch and Sinful Cinnamon, both in the form of a whole pretzel or in those mini pretzel bites served in those French fry containers along with a sweet caramel dipping sauce. But you cannot blame me at all. Have you ever been to a shopping center and smelled the kitchens in their facilities? It should be illegal to open a place that smells that delicious–it’s like walking past Satan’s bakery of sugar-drugged, oily, gluten-laden, sprinkled and syrup-glazed goodies that promise a golden ticket to a magical chocolate factory with candy gardens, dancing Oompa-Loompas, glass elevators and admirable wealth. Someone get me a golden ticket STAT. But truth be told, whenever I’d visit a shopping mall, I’d never, EVER fail to see a Wetzel’s Pretzel booth and beg my mother to buy me one of those sugar-cinnamon or almond-coated pretzels. Luckily, she adores Wetzel’s Pretzel as much as I do and consent to my wishes while sneaking in a few bites of mine. It was fantastic until I discovered that 1) I was lactose intolerant and everything there is coated with butter, and 2) there are absolutely no healthy options served! 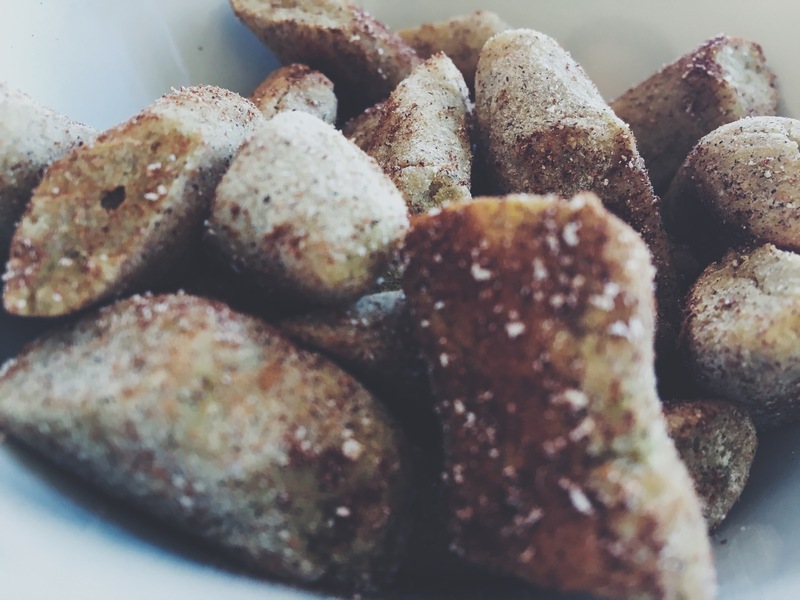 However, you are in luck because I present to you the impossible: a healthy, high fiber, micronutrient-rich, egg free, dairy free, gluten free, yeast free, oil free and three-ingredient recipe for pretzel bites that actually taste like pretzel bites. 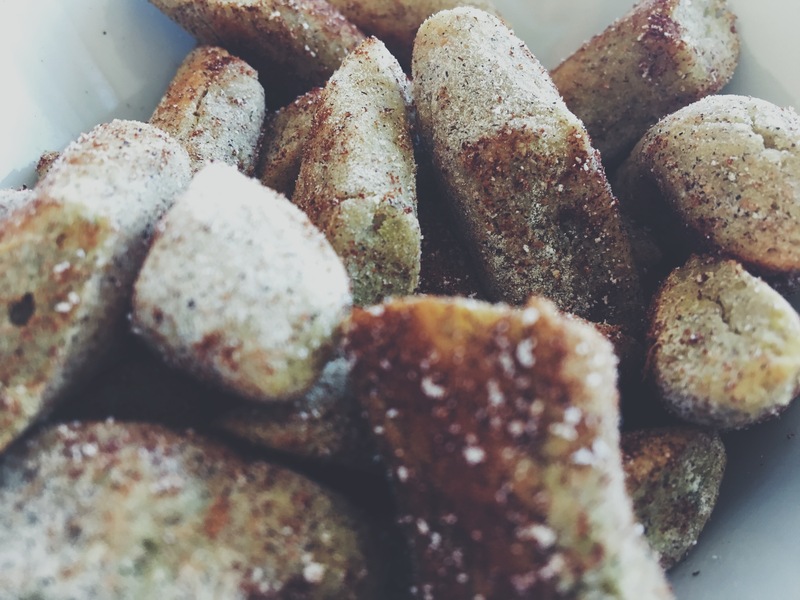 And you’re probably wondering what’s the secret ingredient to these pretzel bites? Hint hint: I eat it almost every single day: sweet potatoes! But not just any sweet potato–a Japanese sweet potato! Yes unfortunately, it does have to be this variety of sweet potato because anything purple will be too crumbly and any red or orange, or even Hannah white sweet potato will be too mushy. Nothing else can yield the same bready consistency as the Japanese sweet potato. However, feel free to experiment and substitute anything you wish so as long as you change the ratios of potatoes and flour accordingly. Also, I chose to keep this recipe oil free because I didn’t think it needed any, but feel free to use any vegan butter, coconut oil, or even organic grass-fed butter if you are not vegan or lactose intolerant as a topping if desired. Bake the Japanese sweet potatoes very thoroughly. If you want to see how I bake sweet potatoes, click this link here. Let the sweet potatoes cool completely and peel. Combine the flesh of the sweet potato, buckwheat flour and baking powder in a large bowl. Mix all ingredients together until the dough becomes thick and creamy. Spread a little buckwheat flour on a separate cutting board. Knead a medium-large scoop of dough in a long pipe-like shape and cut into small pieces. Cover a baking tray with sprayed aluminum foil, or use a silpat sheet or parchment paper to make this recipe oil free. Spread every pretzel bite evenly on the tray and bake for 8-10 minutes each side. Let the pretzel bites cool completely before choosing your toppings. Depending on which combinations you choose, the procedures may be different. Ever wanted to visit Willy Wonka’s factory? What is your favorite pretzel topping? Oh my gosh. I can’t believe how easy they seem to make. They look so tasty! Sinful cinnamon I love it! My sister calls me SINdy and ‘sin’ is one of those words that we have so many inside jokes about! Oh my gosh, that suits you perfectly!